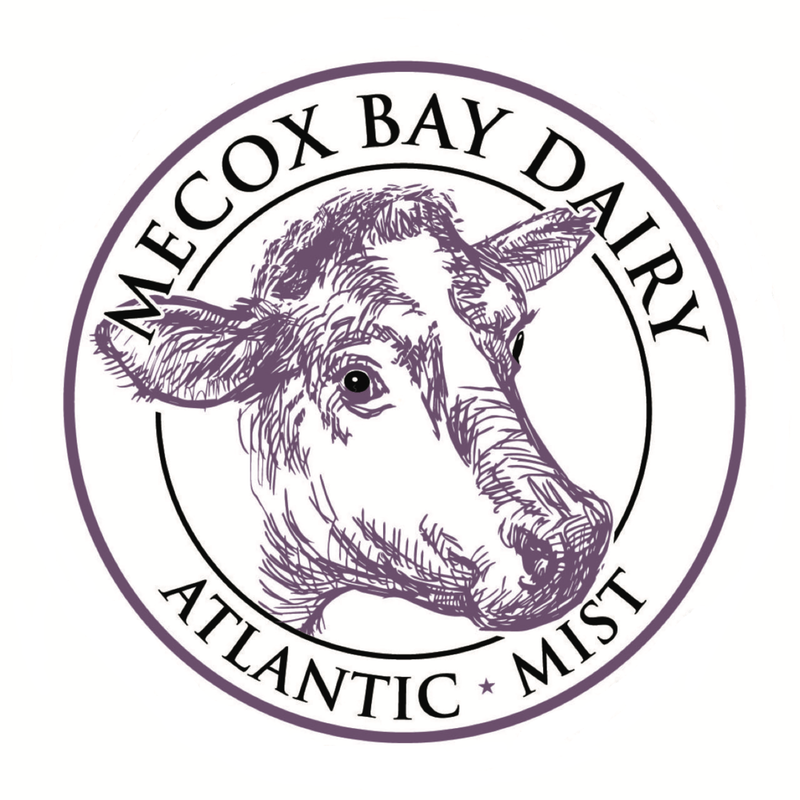 At Mecox Bay Dairy, we believe that ‘Happy Cows Make Happy Cheese!’ Animal comfort and care is paramount and a driving concern of all that we do. Our capable herdsman, Claes Cassel, has spent over thirty years in the care and keeping of cattle, and tends to our herd of over 20 milkers. We also raise heifer calves born here on the farm, along with ten beef cows per year. Our beef cows are all grass-fed on over 30 acres of pasture that has been in the Ludlow family for five generations. Our milking cows are also primarily pastured, eating hay in the winter, which makes for excellent milk and therefore delicious cheese! New calf with heart-shaped markings! The gals enjoying life out in the pasture. Most people who visit us expect to see Holsteins – black and white cows – but we raise exclusively Jersey cows. Jerseys are not only known for being especially sweet and friendly, but also for producing milk that is higher in fat and protein. For a cheese-making operation, this is an important quality, as it contributes to the uniquely rich and flavorful quality of our cheeses. All our cheeses are made with raw milk: milk that has never been pasteurized. The pasteurization process destroys all probiotics and vitamins that occur naturally in cows’ milk, and the cheese that comes from pasteurized milk is inevitably less flavorful. When you purchase a gallon, we bottle it here on the farm right in front of you, so you can be sure that your milk is pure and fresh. It’s important to us to never pasteurize, and we believe you can taste the difference. A great deal of care goes into the making of each cheese – we believe this is the way it should be. Our artisan approach produces unique cheese you won’t find anywhere else. Because it’s handmade, you can expect to encounter subtle differences wheel-to-wheel, but the high quality and depth of flavor is constant. We recommend trying each one to find your favorite. As Art likes to say, his favorite cheese is whichever one he is eating at the moment! Clockwise from top left: Mecox Sigit, Farmhouse Cheddar, Atlantic Mist, Mecox Sunrise. Our cross between a Brie and a Camembert, the Mist has the flavor and texture of a Brie, but in the size of a Camembert! This “mini Brie” is decadently creamy and has a mushroomy, woodsy flavor. A young English-style cheddar, our Cheddar is aged 8 months. It is soft and creamy with a flavor that is sweet and pleasant, like the temperament of our Jersey cows. Our stinkiest cheese (and also our favorite)! The Sunrise is a washed-rind tomme, aged 3 months. It is pungent, memorable, and makes an adventurous addition to your cheese repertoire. This alpine-style cheese is aged 2 years, and has a buttery, nutty quality. Named for the matriarch of the Ludlow family, it is toothsome and dry, like Marjorie “Sigit” Ludlow’s humor! We select just a few special wheels of Mecox Sigit to stay on the shelves for up to five years to become Sigit Reserve. This rare variety has a strong nutty flavor, and crystallized amino acids add a satisfying crunch to every bite. This mild and creamy alpine is similar to a Cantal Fermier, and is aged less than one year. It has a soft interior, with the same buttery sweetness found in our raw milk. Our new take on a Stilton-style blue cheese. Crumbly, bright, and distinctive. From the native American word for "south wind," this cheese was inspired by the breeze that blows over Mecox Bay and through our pasture. Like the wind, this cheese is gentle and mild, with a creamy texture. This delicate, fresh classic is available only during the summer. It is refreshingly light with a creamy texture. Our Thanksgiving turkeys are well-known locally for being juicy and delicious! Turkeys are raised on the farm throughout the summer and pastured next door to the cattle. They are then vacuum-sealed and sold direct to you, fresh for the holiday. Turkeys are SOLD OUT for 2018! Please check back next year, or call us to join our waiting list.